This pattern really was a matter of serendipity. Following the design of my Lovely for Lavender hexagonal lavender bags with stranded colourwork, I wanted to work more with the hexagonal shape and envisaged a sock yarn leftovers knitted quilt. However, I wasn’t sure about knitting that many hexagons to the same pattern so tried out a few other increase options for a bit of variety. My first attempt was to use yarn overs, but absent-mindedly swatching in front of the TV, I did the increases too frequently and my hexagon wasn’t really a hexagon in the sense of a nice flat potential quilt shape, so it disappeared into the bottom of my knitting bag and there it stayed and the whole idea of the quilt was shelved as other projects took over. 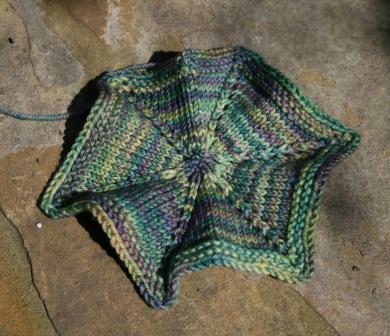 This swatch stayed in my knitting bag for ages. It was only when I realised that a number of friends were due to have babies in the next few months, that I picked up the copy of Knit One, Knit All by Elizabeth Zimmerman which I’d bought at the Harrogate Knitting and Stitching Show last year. 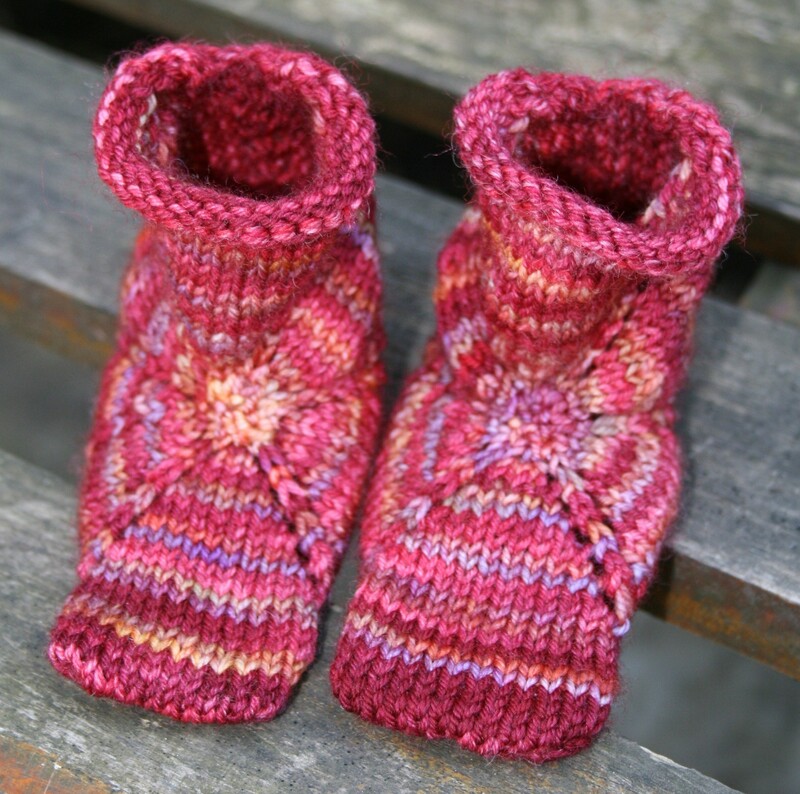 As I flicked through to see if there were any baby patterns I wanted to knit I saw the pattern for Star Booties, did it occur to me that my failed swatch could be folded in the same way to make a bootie. So I dragged out the previously written patter, ignored the garter stitch edge and made it a little bigger and indeed it did make a bootie. 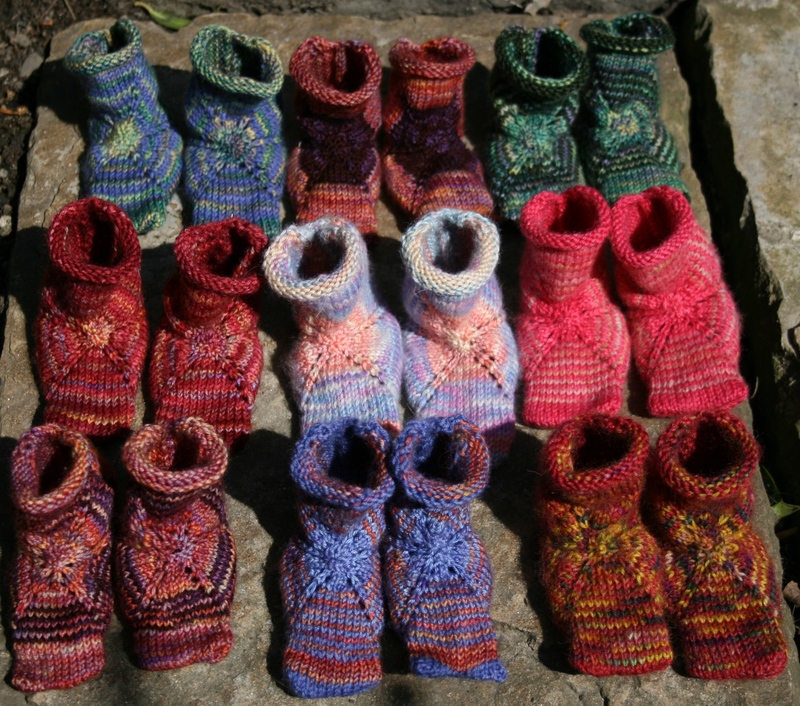 My samples, and they became a little addictive, were knitted in real odds and ends of sock yarn, mainly Malabrigo sock and Skein Queen Splendid sock yarn. Mine weigh in at 14g a pair so just a little more than that to be on the safe side and you’re ready to go. 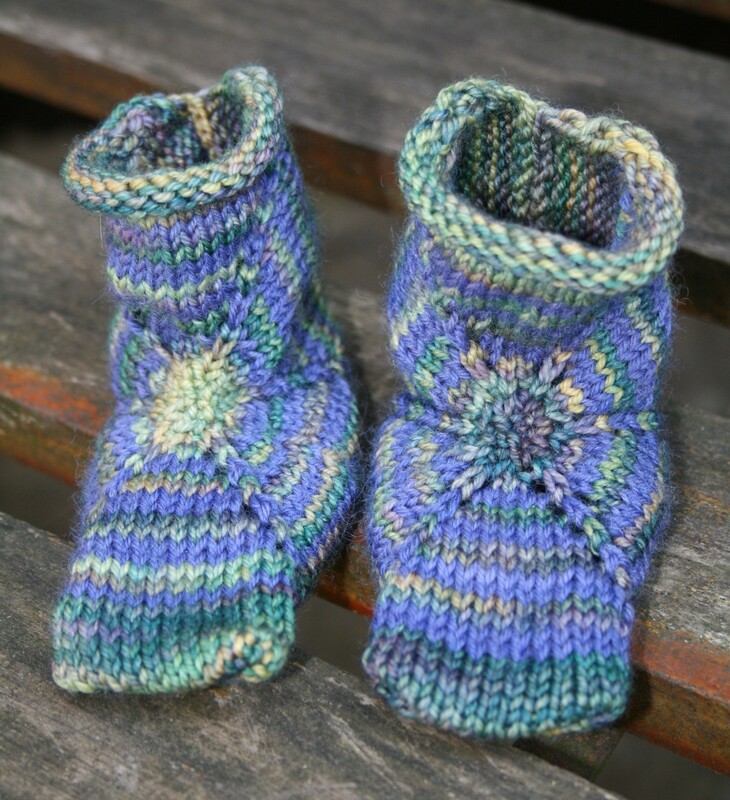 The booties are knitted from the centre out on dpns staring with a small number of stitches and increasing as you go. 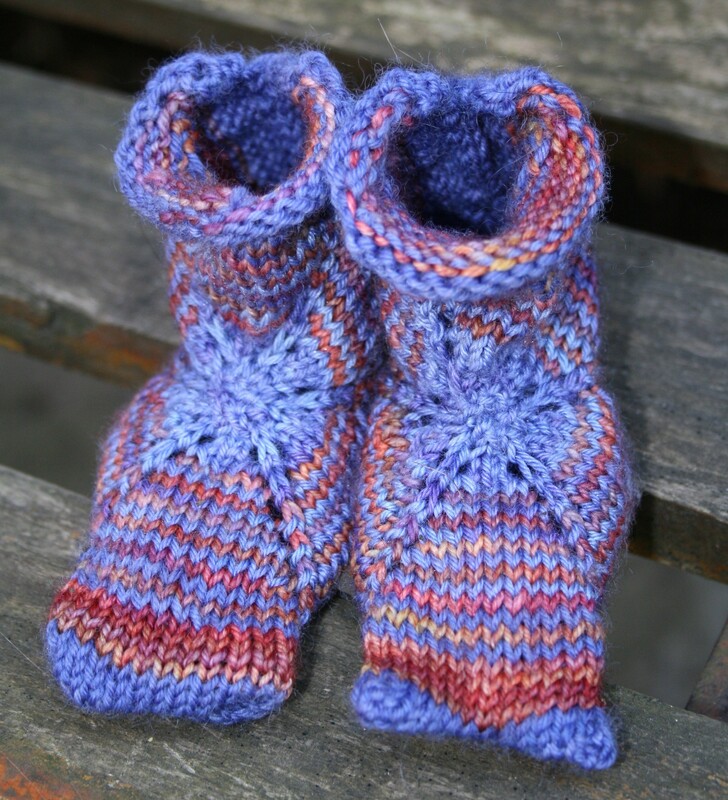 This pattern is available free but I would ask you to consider making a small donation to Kids Company for the use of this pattern through my Just Giving page. This way the money goes directly to Kids Company to help fund their incredibly important and inspiring work with disadvantaged children and young people.